RATES: 2015, $27 for non-Maine residents, $19.44 off-season; $16.20 ME residents in season; $10.80 off season. Rates include taxes. FIRST-COME-FIRST-SERVED: Yes. See campground map (sidebar) for reservable and non-reservable sites. GPS: N 45.24850, W 69.240869. This marks the turnoff to State Park Road along which the park and campground will be found in a few miles. 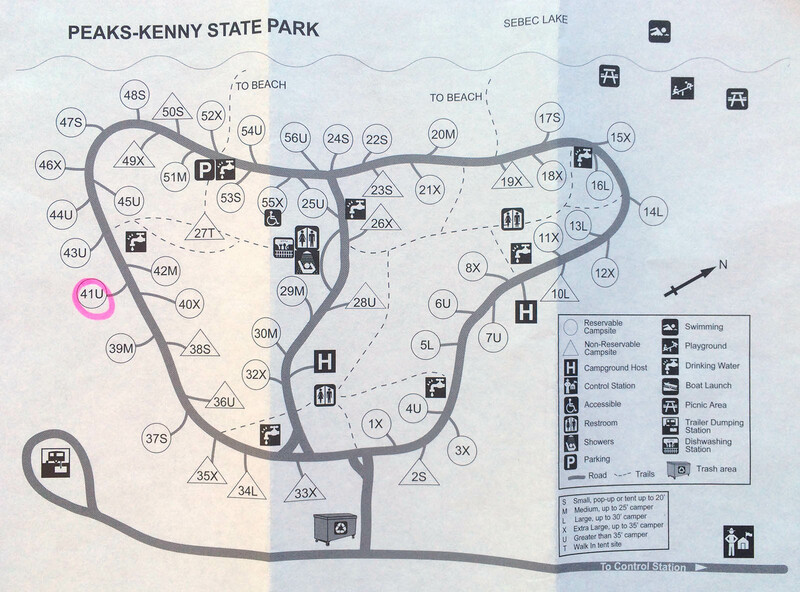 Peaks-Kenny Campground Map. Note the size codes and reservable/non-reservable status of the campsites. ACCESS: Roads to the park are paved (see my notes below) but beyond the entry station the road to and within the campground is dirt and gravel. There is one handicap accessible site. MAXIMUM RIG SIZE: Some sites should be able to accommodate the largest rigs plus towed vehicles. See the map in the sidebar for more. Note the codes for vehicle sizes and that no maximum size is specified. Data transmission was intermittent and I could only obtain it using my booster. Site 42 at Peaks-Kenny State Park Campground is fairly typical of the sites there. Since when do trees grow out of rocks? BUGS: At times there were enough mosquitos to be a little annoying, but not swarms by any means. A few black flies were about. See my additional comments below. 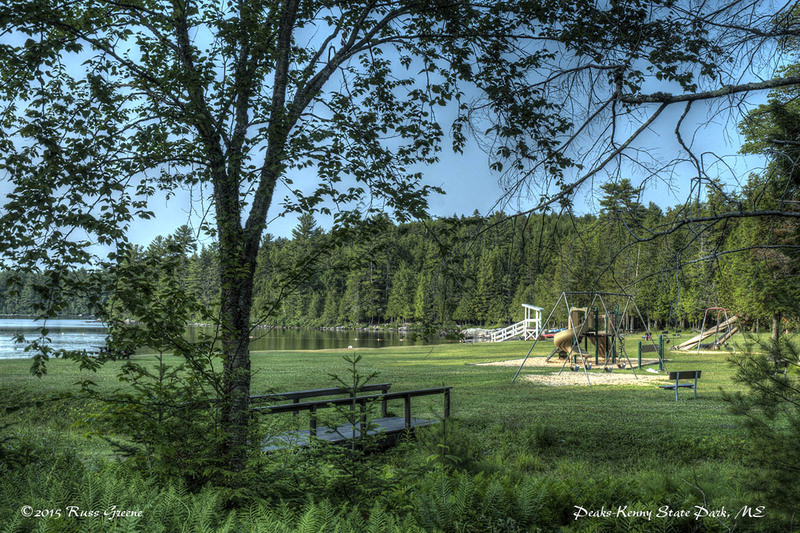 RV Parks: AllStays indicates the nearest campground to be Balsam Woods Campground, Abbot Village, Maine 04406. It’s an independent. 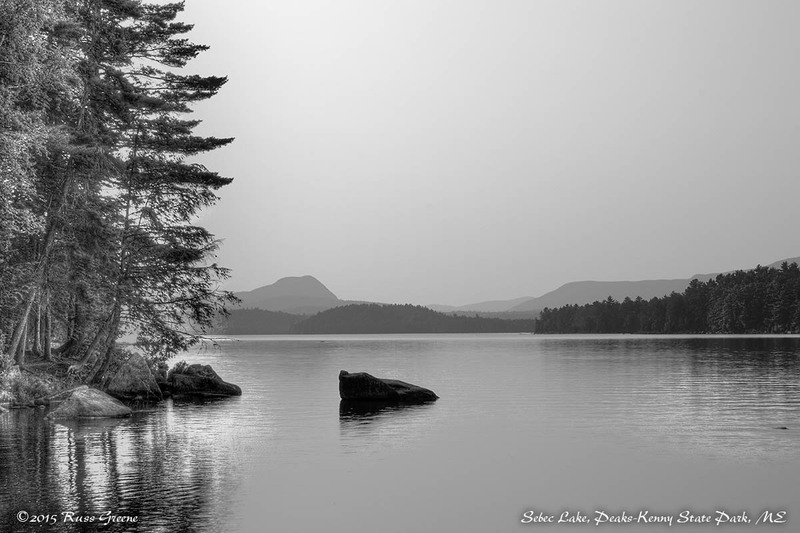 Peaks-Kenny is a very nice campground in the Maine woods alongside Sebec Lake at which you’ll find swimming and boating–canoes and kayaks can be rented for just $3 an hour! 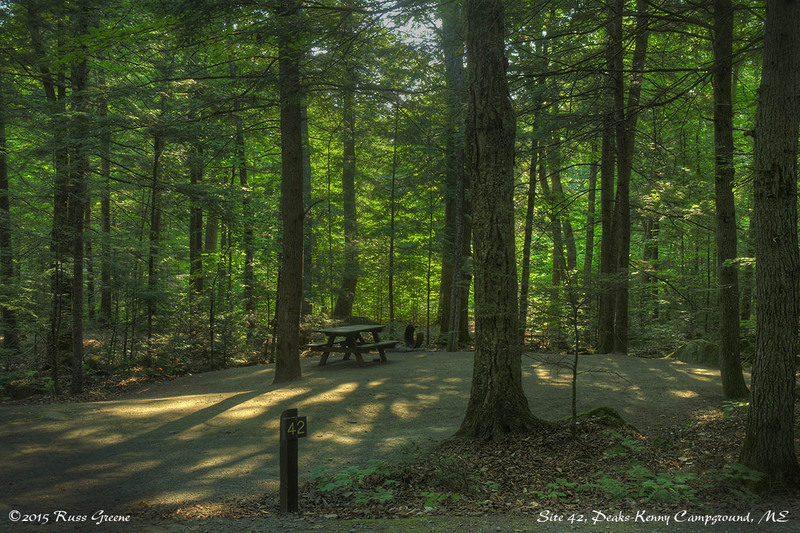 Picnic tables and waist high BBQ grills are located lakeside in the shade of the trees. There is a roped off swimming area at the lake and a lifeguard stand which I presume is staffed during certain hours. “Very nice” is subjective of course, but my kind of campground is in the woods with lots of green, awakening to songbirds in the morning, spacious and well spaced camp sites and quiet nights. Of course, some of these things are seasonal. Generator hours (8-8 if I recall) are different than quiet hours and I was told that if a neighbor complains even during generator hours you may be asked to shut yours down. My RV Family in Site 41 at Peaks-Kenny State Park Campground, ME. I mention above that the roads from the entry station to and within the campground are dirt and gravel. I would estimate that they are quite passable for any rig although I did travel a little slowly at some places. It’s about .8 mile from the entry station to the campground. The paved road from the town of Dover-Foxcroft to State Park Road is of more concern, in my opinion. 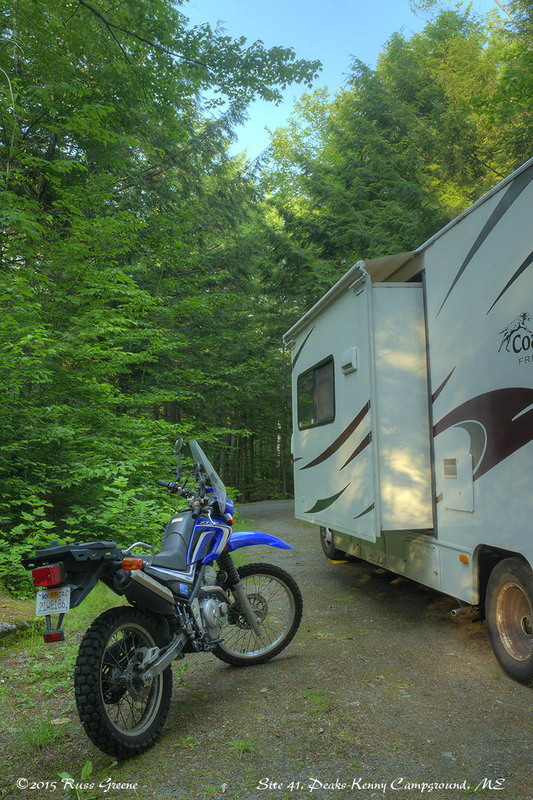 While it too is passable, the 45 MPH speed limit, or whatever it is, is much too fast for an RV to drive because of the bumps and dips along the way. It’s not a long drive, however, something in the order of maybe 10-15 minutes I’d guess. Don’t let that stop you from going, just be prepared. Like many campgrounds in the summer (I was there mid-July), Peaks-Kenny was full or nearly so on the weekend but emptied out considerably once the weekend passed. 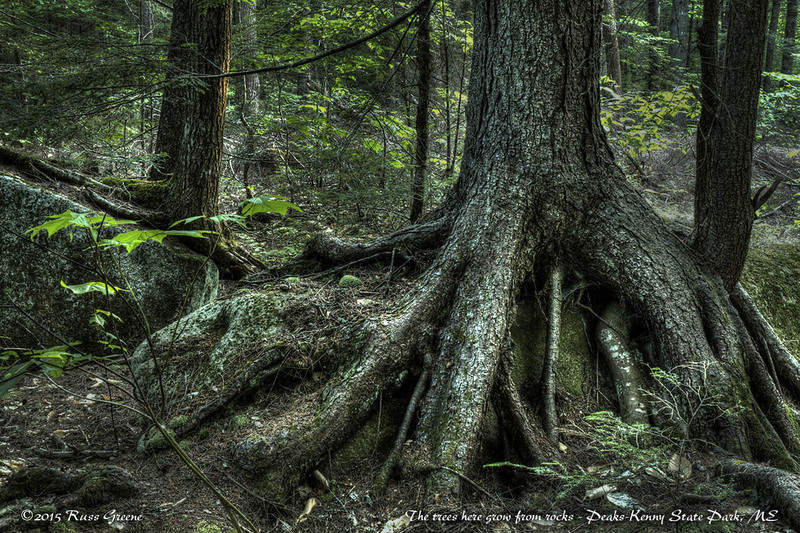 The setting is in tall trees of the Maine Woods. One thing I noted while there was that a great many trees appear to grow right out of rocks or boulders. They don’t of course, at least I don’t think so. My estimation is that the detritus on top of the stone created by decaying, fallen leaves forms a rich bed in which seedlings take hold. As they grow they shoot out roots which wrap themselves around their host stones in order to find more substantial nourishment in the earth below. That’s my guess, anyway. I’d been told that the black fly season in Maine subsides about the middle of July so I timed my arrival with that information. Other places to which I traveled while camped at Peaks-Kenny had more of a black fly problem, the gate house to the Gulf Hagas Rim Trail being such a place. There I put on some DEET, but at the campground I didn’t find insect repellant really necessary. 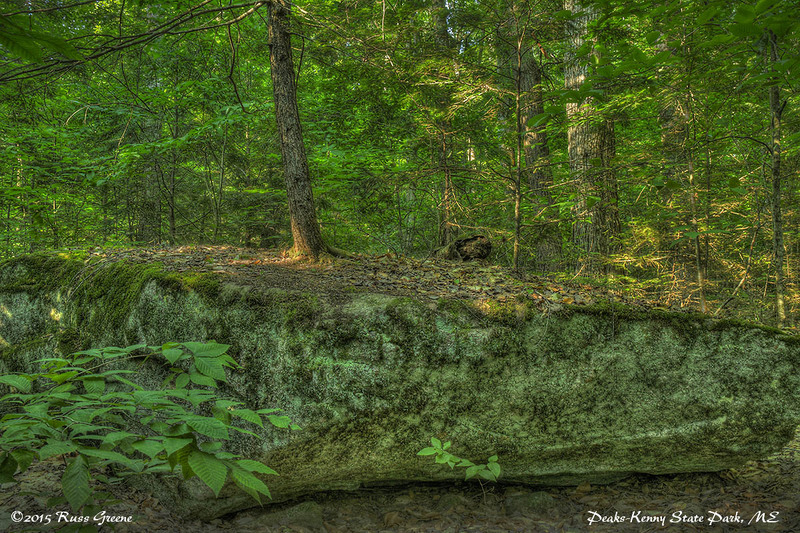 A great many of the trees at Peaks-Kenny State park Campground appear to be growing out of solid rock. The Peaks-Kenny Guide & Map available at the entry station shows several short hiking trails from .4 to 3.4 miles. The same pamphlet outlines some campground rules and park history while also suggesting a couple nearby attractions. etc. It is one of the more nicely done handouts I’ve seen at a campground. Staff at the campground was friendly and helpful. The restroom/shower arrangement in the building I used (there is at least one other building, arranged differently) was interesting. The building was made of cinder blocks. It contained 10 separate shower/restrooms each about 10′ square, and each containing a shower, sink, toilet and bench. Water temperature was not adjustable at either the sink or shower, but both provided hot water. Hand soap and paper towels were also provided. Showers were the annoying pushbutton variety but the water temp, flow rate and shower head positioning were all passable. Toilet paper was on a dispenser much like the type you probably have at home and didn’t require you to be a contortionist in order to get to the TP. There was no place in the shower to set down you soap and shampoo but the sinks are right next to the showers so they can be used for this purpose. While not entirely ideal the arrangements at Peaks-Kenny were better than many if not most other campgrounds maintained by government that I’ve encountered. Another negative was that the floors could become wet around the toilets so that any clothing that touched the floor while using them could become wet as well. Although not directly relevant to my report on Peaks-Kenny, one of the things I learned from someone on staff there is that Maine has a tradition of allowing the public to camp, hunt, fish, etc. on privately owned lands. This is at the discretion of the land owner, but it is something of a Maine tradition. It was recommended that I pick up a DeLorme Gazetteer. I found an interesting publication online if PDF format which, if you are curious to learn more about this, look for Public Access to Privately Owned Land in Maine by James M. Acheson. I went to Peaks-Kenny specifically to hike the Rim Trail at Gulf Hagas, about an hour’s drive away. Gulf Hagas is sometimes referred to as the Grand Canyon of Maine. Photos of the waterfalls along the trail which I found online made it look like a terrific place to visit. Unfortunately, due to what I regard as the inept bungling the web site of North Maine Woods, Inc., the gatekeeper to the access road, I was unable to enter. Motorcycles, ATVs and bicycles are prohibited from traveling the road from the gate house to the trailhead parking area some 6 miles away and I was traveling by motorcycle. At the time of this writing (7/15/15) there was no mention of these prohibitions on their web page (URL above). In my personal opinion there are numerous other problems with their web page which indicate a rather thoughtless and haphazard effort including failure to provide proper directions and in fact providing misleading information instead. Their page stated “You can access Gulf Hagas from Hay Brook”, but if you search Google Maps for Hay Brook, ME it drops a pin in the middle of a river some 70 odd miles away from where you want to go. Should you wish to hike the Rim Trail, the turnoff from Rte. 11 to the Katahdin Iron Works road, the road that leads to the checkpoint and trailhead parking area, is at N 45.40805, W 69.06195, and the checkpoint itself is at N 45.44499, W 69.17388. I have written to North Maine Woods, Inc. to explain my views of their web page and my experience as a result of relying upon it. In what I regard as a lame reply they stated that the information about access restrictions is found on page 6 of their brochure which can be downloaded from their home page. Why isn’t it on the Gulf Hagas page where it should be, I ask?